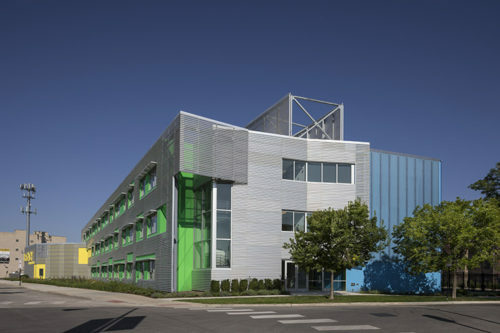 In 2015, Legacy Charter School on Chicago’s West Side was sharing space with a Chicago public school and, to achieve its mission of enriching students and the community, decided to construct a three-story, 61,200-sq-ft K-8 school located in the North Lawndale neighborhood where it had been sharing space. Legacy is a public elementary charter school offering tuition-free education to all children in the area, and its leaders saw the new building as a natural growth of the institution. Construction manager W.B. Olson faced challenges before breaking ground. The existing site chosen for the new school had toxic soil that could not be remediated, rendering it unable to be used as clean construction fill. The conditions required that a geomembrane be installed under open areas covered by lawn, landscape and playground. These areas had to be excavated to 18 in., at which point the membrane was placed before it was covered with clean fill. Legacy’s goal of enriching the community led to several sustainable design elements. Photovoltaic roof panels provide 13% of the building’s electricity and return excess power to the grid. The building was designed by Lothan to employ a more colorful, geometric layout. It features brightly colored structural precast concrete within a metal scrim that changes in the light and looks different depending on the season and time of day. Students call it The Big Crayon because it’s so bright and lively.